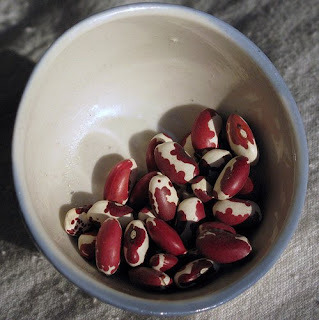 I have been eating Anasazi beans for about 20 years. I love them. They are kind of like pinto beans but with a softer and smoother taste. They are great in 3 Sister Stews and make wonderful vegetarian chili, refried beans and can be used just about anywhere you would use a typical pinto bean. I got my very first bag of these great beans in Dove Creek, Colorado and that is still a big grower of the bean still. They get there name from the Anasazi Indians. The word Anasazi means "Ancient Ones". They were the precursor to what we now know as the Pueblo Indians. They were in North America building cliff dwellings long before Europe even knew about America. They found some of these beans in dried form in the ruins and planted them hoping to have them grow. They did not really expect that these beans would be capable of growing. To their surprise they did grow and they made beautiful beans that we now use today. You may ask how I know this. My husband is fascinated with these people and has made it a life goal to see every cliff dwelling available in the southwest United States. We have now been to four of them. We are planning a trip at some point toward the Grand Canyon to see more once the kids are a bit older. I still have the fear that the two little boys will fall in at this point if we went. LOL Dan reads books and makes trips to sites every summer. One of the largest ones is in the 4 Corners area (Arizona, Colorado, New Mexico and Utah junction). We have seen Chaco Canyon and Mesa Verde and two smaller sites. I must admit that the dwellings are fascinating. They were very smart people to design some of the things they designed way back when they lived.